Our country went through an era when "Fat-Free" was all the rage. And as a result, every product, advertisement and healthy-eating article guided us toward avoiding fat. It was suggested that fat was bad for you, that it caused heart disease, and obesity. It is easy to believe that eating fat causes us to get fat, but that isn’t actually how our bodies work! No FAT is NOT good, as I pointed out in my previous blog ‘Better Living Guide to Better Eating’. With that said, let’s not push the pendulum too far in the other direction, as ALL FAT, or too much of the wrong types of fat, are not good either. It's all very confusing, so it’s no wonder we Americans are perplexed about what to eat, and who to believe! There are so many articles, blogs and books that give advice about nutrition, but the information is conflicting, and not backed up by research. One source we trust is Jens Reviews. We validated the information in her recent blog on Mackerel, and it was spot on! Other sources that we recommend for the latest nutritional information are www.healthline.com and www.webmd.com, which we referenced in this blog, as well as European Journal of Clinical Nutrition, examine.com and consumer lab.com. My research confirms that FAT is an essential component of the human diet and should amount to 20-35% of your caloric intake. This is critical because some of the Fatty Acids, which are building blocks of fat, cannot be made by the human body, and MUST be consumed in your diet. Adding the right kind of fat to your diet can actually help you lose weight. As an example, I have a client who recently added fat back into her diet, according to our guidelines, and she has since lost 12 pounds so far! Consuming more than 35% fat will generally push you past your caloric requirements, and you will gain weight simply because you are eating more than you are burning. So what happens if your body doesn’t get the essential fatty acids it needs? Well, your body finds ways to function, because you were designed to survive, but it will not function optimally. Omega 3 Fatty Acids - play a critical role in the optimal structure and function of cells. They also play an important role in prevention of heart disease by helping to lower blood pressure, prevent blood clotting formation, and reduce inflammation. Omega 6 Fatty Acids - protect heart health by lowering LDL cholesterol, and improving insulin resistance. However, they tend to promote clot formation, inflammation and blood vessel constriction, so you have to be careful with the quantity. General guideline is no more than 4 times the amount of Omega 3. Omega 9 (Mono-unsaturated Fat) - these can be produced by the body, so they are not technically essential. However, consuming foods rich in omega-9 fatty acids may have a number of beneficial health effects, including reducing plasma triglycerides and "bad" very-low-density-lipoprotein (VLDL) cholesterol, as well as improved insulin sensitivity and decreased inflammation. The same study found that humans who ate high-monounsaturated fat diets had less inflammation and better insulin sensitivity than those who ate diets high in saturated fat. Saturated Fat - This is also not essential, but includes delicious foods like butter and cheese that most of us don’t want to stay away from. Therefore we should limit to only 10 percent of saturated fat. Trans Fat (known as partially hydrogenated oils) should be 0% of your diet. These industrially manipulated fats were created by food manufacturers to extend shelf life, and improve taste and texture. They are no longer recognized as safe by the FDA, and Companies were given until end of 2018 to phase out artificial trans fats from their products. 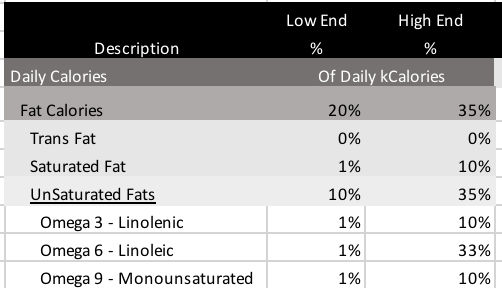 Here is our recommended percentage of each type of fat that you should include in your daily diet. These ratios are shown in ranges by category. When you consider your fat consumption as a percentage of overall daily calories, you should try to achieve balance of all of the other fats, so that you get all of the benefits from fat, without any negative impact. 1-10% can be saturated fat, so that you can enjoy the flavors, and the balance should be unsaturated fat. Many Thanks to the following resources for helping me better understand the essentials of fat!